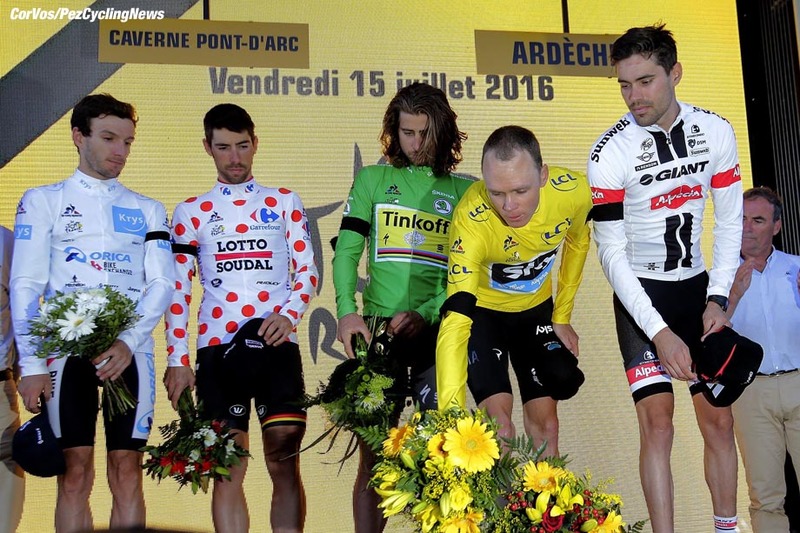 PezCycling News - What's Cool In Road Cycling : TDF’16 Roadside: Ed The Eagle Has Landed In France! TDF’16 Roadside: Ed The Eagle Has Landed In France! 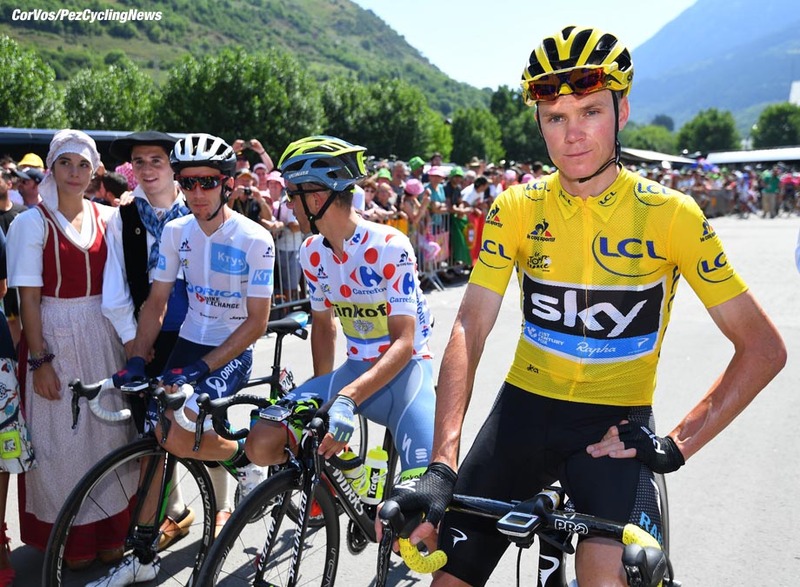 No more watching le Tour on TV; Monday I woke up energized, full of the emotions that come with being on a Grand Tour. And in Les Alpes, no less. This year it's tempered of course by the horror of what happened in Nice; I've strolled the Promenade des Anglais, taken in the rollerbladers and beautiful people as I sipped a kir at one of the pavement cafes. 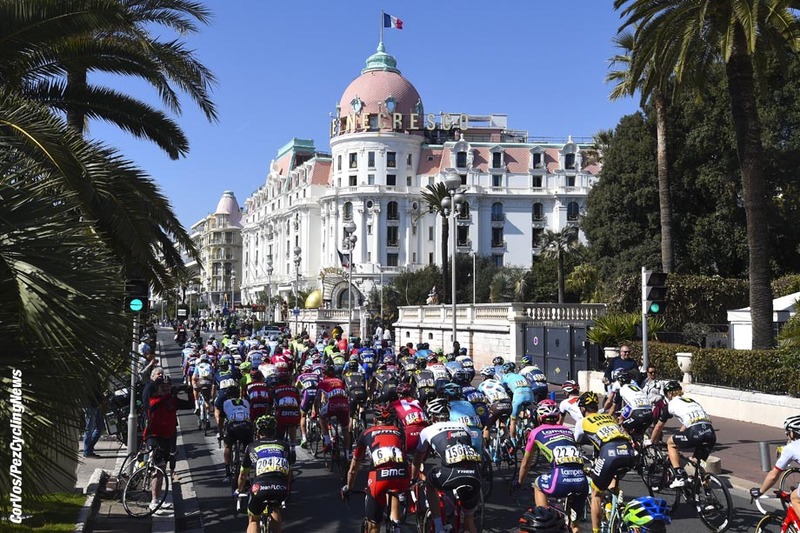 I've watched the Giro prologue take place on that very stretch of road where so many people died - the memory of Alex Zulle blasting along under the palm trees is still fresh in my mind. But there's a job to do and life goes on, albeit with the realization that the world is in a state of flux and a very dangerous place - even taking a late night stroll along the shore of the Bay of Angels. But what of the race? Let's start with Cav; before the race I believed that he'd won his last Tour stage and that Eddy Merckx's record 34 stage wins was out of his reach. I got that one wrong, he's now on 30 stage wins and if he does make it to Paris then 31 is well possible. There can be no caveats, he's beaten the all of the season's fastest finishers; Coquard, Greipel, Groenewegen, Kittel, Sagan - and let's not forget McLay. Just Bouhanni is missing; his mum should have told him to keep his hands to himself. . .
30 Tour stage wins, more to come? If there's a 'but' around Cav it has to be that the sprint stages have played comfortably into his hands; a virtual promenade with just the last five K jumping to warp speed. 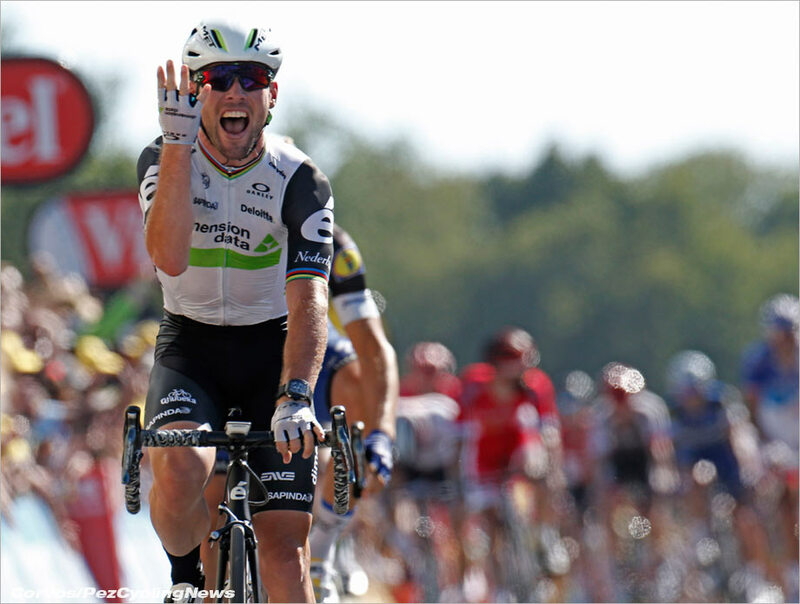 For Cav, with his track preparation, it's a Godsend. There's another factor in play, namely that the lesser French teams who would normally animate the breaks all have - or think they have - a sprinter. Direct Energie have Coquard, Fortuneo have McLay and Cofidis have Laporte - instead of firing men up the road they're all waiting for the sprint, adding to the sportiv style racing. But back to Cav, there's a conundrum now; battle through the last week in the mountains to Paris and the sea of cobbles that is the Place de la Concord or climb off? If he goes to Paris there's an excellent chance he'll win his fifth stage of this race - a prospect which seemed fanciful just two weeks ago. Here's the 'BUT' - any coach will tell you that if endurance goes up then speed goes down (Peter Sagan excepted, of course) and a week in the mountains just is not the ideal preparation for an Olympic Omnium competition. 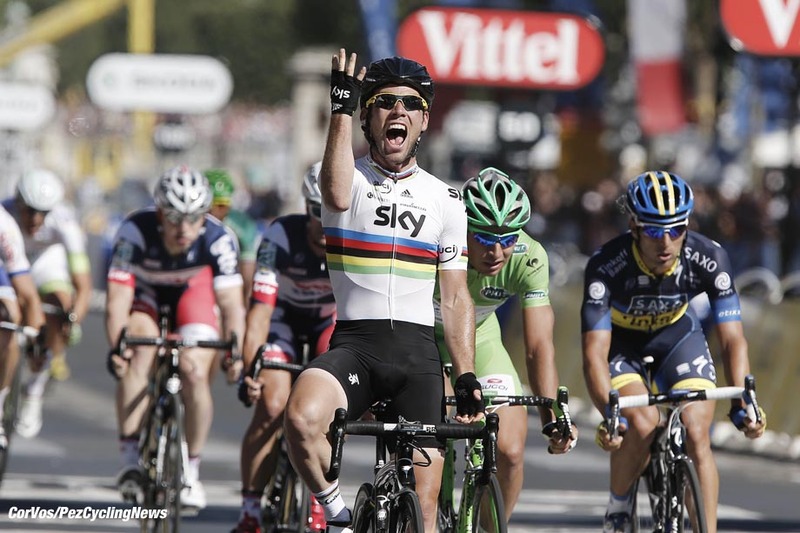 Team GB will want Cav home NOW to sharpen up for Rio. Delloite, who pay his wages will feel like Cav must be right now, torn between and 9/10 chance of Stage 21 glory and maybe a 5/10 chance of an Olympic medal. He can't have both. Continuing on the subject of fast men, it looks as if Greipel 'peaked' at the Giro - he's just not the same man he was. 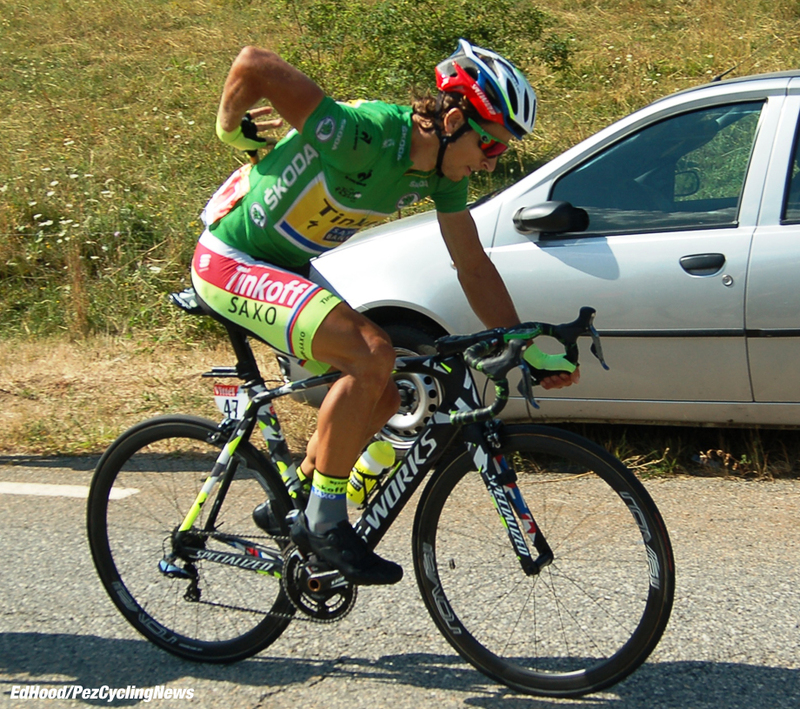 But like Robbie McEwen says; "the Tour is at a different level from the Giro." Kittel is at the highest level, it's just that Cav is smarter. 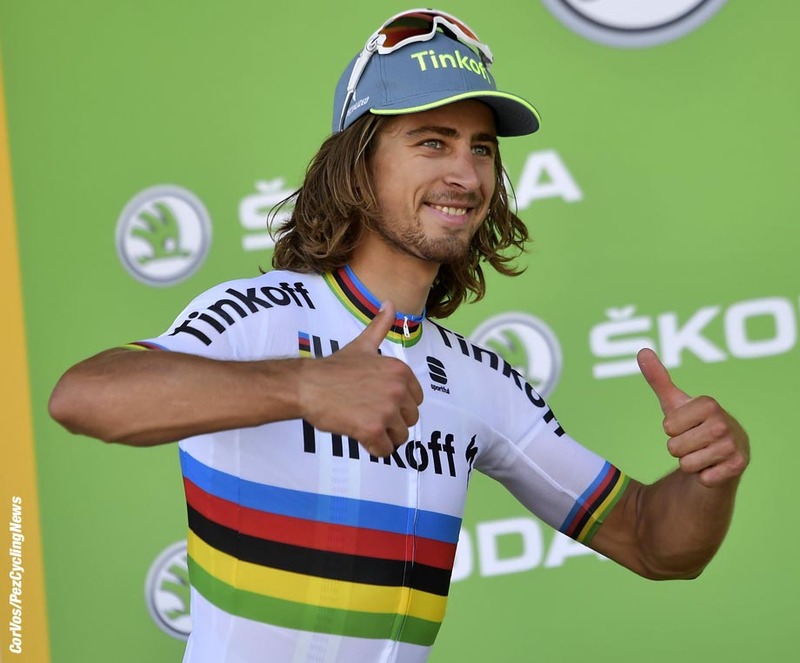 Sagan; all of a sudden there's not a word about "the curse of the rainbow jersey" - he's only just off the pace of the very fastest in the finale's and can even ambush a speeding peloton to thwart the fast men. He can out punch the 'puncheurs' and he does it all with grace and good humor - I've even forgiven him the haircut. 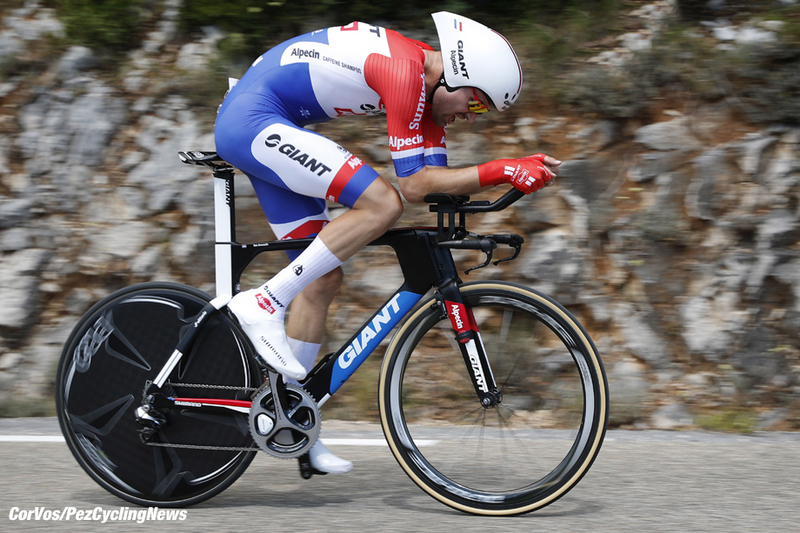 Dumoulin has under scored his ability as a strong man, both at Andorra and in the chrono; his winning margin against the watch was exceptional at this level and stamps him as the number one favorite for the Rio time trial. The pundits are already branding him as a Grand Tour winner - that'll be like Geraint Thomas's GC challenge, the Nibali/Aru and Valverde/Quintana polemics. One day these issues are screamed from the roof top but as they fail to materialize they're quietly forgotten. And what of the maillot jaune? Froome may not delight the eye with his, 'puppet on a string' style and that descending technique to his stage win. . . Oh dear. The 'but' is that it's apparent he wants it more than anyone else. He's impossible to drop - Richie Porte falling off in front of him notwithstanding - in the mountains; his descending is inspired and against the watch he's the best. Of his rivals, Contador is gone, Quintana looks average and only Mollema seems to want it badly enough. Barring accident or act of God, the Tour looks won to me. Is the Tour won already? But let's go back to the "Porte Polemica" when, if you boil it down, amounts to Our Richie riding into the back of a stationery motor bike. Some would say the result should have stood as an "incident of racing" - Bauke Mollema managed to get away again after all and has a right to be disappointed in the judge's decision. The problem was the shortening of the stage, a quart won't fit into a pint pot. Thee times I've been up the Ventoux on race day it's insane - no other word for it. The crowd is huge, many of them are intoxicated and driven stir crazy with the heat. It's always been thus; I remember being on l'Alpe d'Huez in 1992 when Hampsten won. It was madness, a sea of hyper people on the road only leaping clear as the riders were within touching distance; the phenomena is nothing new therefore. In today's Observer newspaper there's a piece from William Fotheringham, the gist of which is that something has to be done about the crowds. Of course, he doesn't tell us what should be done. . .
And in the same newspaper we have Richard Williams telling us that motor homes should be banned from the verges. To use modern parlance, Mr. Williams just doesn't 'get it' - thousands of people make the pilgrimage to the Tour in their campers. It's part of the ritual, part of their life - he calls them "unsightly," to me they're beautiful. Idiots in their underwear are another matter and perhaps it's down to responsible fans to 'have a word' and the gendarmes to be a little less tolerant. 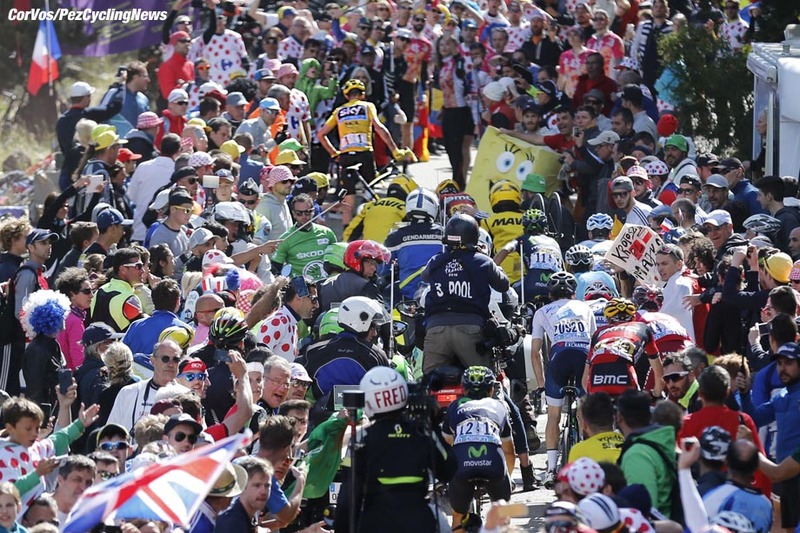 The main problem on the Ventoux was that instead of being 'spread' over the whole length of the climb they were concentrated in just 10 kilometers giving a much higher density of spectator per meter. And given that the organizers had to make a late decision to change the finish due to the high winds, there was no time to move the barriers further down the climb. What can be done? Little, save try to educate the fans and tell them that if the behavior doesn't improve then perhaps cult climbs like l'Alpe and the Ventoux can no longer be included in the race. That would make them take notice. But like Contador's abandoning, Pinot's departure and Simon Gerrans' getting the blame for his front tyre losing its grip on boiling tar, it'll all soon be forgotten as le Tour turns the pages to its next chapter. All forgotten except what happened in Nice, that is.